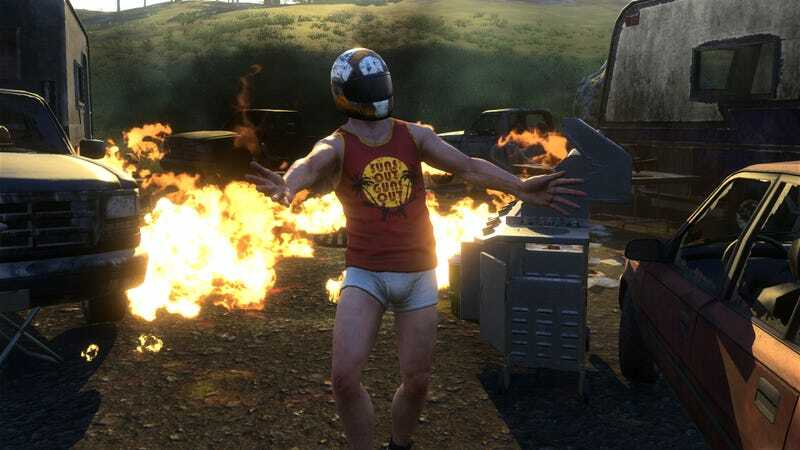 H1Z1: King of the Kill is one of the most popular games on Steam, despite the fact that thousands of fans claim to hate it. Now that a similar game, PlayerUnknown’s Battlegrounds, has appeared, many say they’re going to jump ship for good—and this time, they really, really mean it. Maybe. King of the Kill is a battle royale game that begins with you and more than 100 other players parachuting onto a massive, fully open map. You then scramble to amass a small arsenal of weapons and armor before somebody else beats you to a bloody pulp and steals your shoes. You have one life. Last person standing wins. H1z1: King of the Kill, which was spun off from Daybreak’s hit zombie survival game H1Z1 in February 2016, didn’t launch to much fanfare. For the first few months, it peaked at a respectable, but not amazing, 19,000 concurrent players. By the start of 2017, that number was typically between 40,000 and 50,000—high enough to firmly entrench King of the Kill in Steam’s top ten. These days, it regularly commands an audience of over 100,000 concurrent players, more than anything save DOTA 2 and CSGO. Some of King of the Kill’s slow-burn success can be attributed to streamers, who started showing up in earnest after Daybreak released a major update that introduced, among other things, native Twitch integration. Watching a good streamer play the game is an experience equal parts tense, triumphant, and tickling. Odds of victory are low, but you never know quite what will happen. Different streamers try different strategies. Some grab a car and transform into a mix of Rambo and Knight Rider. Others try sneaky subterfuge. A handful work together. Occasionally, you’ll even get some of that borderline-sociopathic social engineering that made games like DayZ so popular back in the day. The game’s store page is marked by a splotchy rash of red thumbs-downs, almost unanimously citing the same issues. And yet, for all its popularity, King of the Kill’s recent reviews on Steam are only 59 percent positive, garnering it an overall rating of “mixed.” This is quite unusual, since the vast majority of games in Steam’s Top 10 have an overall rating of “very positive.” The game’s store page is marked by a splotchy rash of red thumbs-downs, almost unanimously citing the same issues. The game can be fun, they say, but it’s just too buggy and unfinished. On top of that, some feel that Daybreak is prioritizing the addition of new microtransaction-based items over bug fixes and quality of life improvements. They worry that it will never realize its full potential, or even evolve very far beyond where it is now. In my experience, the game is glitchy and janky, to the point that it can interfere with people’s fun. And yet, hundreds of thousands of people keep playing it, because they love the concept and the moments the game can create. For example, the top review on the game’s store page right now reads, “I’ve uninstalled this game four times.” That means they’ve installed it four times, too. Next to the big thumbs-down in their review is a time-played counter that reads, “130.1 hours played.” They can’t quit! They keep coming back in spite of themselves. It’s the very definition of a love-hate relationship. “Alright, I’ve spent well over 300 hours in this game, but that doesn’t make it a good game,” reads another review, originally posted in October 2016. Since then, that person has spent an additional 430 hours with the game. What’s recently brought this simmering resentment in King of the Kill’s community to a boil is the appearance of a very similar new game from battle royale pioneer PlayerUnknown with the unwieldy title of PlayerUnknown’s Battlegrounds. Countless recent King of the Kill reviews and discussion threads invariably lead to calls to just play PUBG instead, because it’s supposedly less buggy. This is at certainly up for debate: PUBG is also still in Early Access, and in my experience, it’s fairly janky and has some serious performance issues. Most tellingly, major streamers who moved on from King of the Kill, like Summit1g and Lirik, are suddenly interested in battle royale again. Longtime King of the Kill streamers like StevoLIVE and Grimmmz are now all aboard the PUBG train, while others are trying to juggle the two. Most tellingly, major streamers who moved on from King of the Kill, like Summit1g and Lirik, are suddenly interested in battle royale again. On Twitch right now, PUBG regularly pulls between 50,000 and 100,000 simultaneous viewers, while King of the Kill only manages half that. Could it be that players are finally putting their money where their mouths are and quitting the game they claim to hate? Once again, it depends on how you look at things. Shortly before PUBG came out, King of the Kill’s daily concurrent numbers were at an all-time high, peaking at nearly 124,000. In the week since PUBG came out, there’s been a definite downward trend, but King of the Kill still peaks at around 111,000 each day. It’s still huge, and in time, players’ shift to PUBG could simply turn out to be a brief flirtation. It’s worth noting, though, that King of the Kill is weakest during the times PUBG is strongest. They basically trade spots on Steam’s Top 10. Most crucially, though, King of the Kill and PUBG are not the same game. Daybreak’s game is more arcadey and fast-paced, while the newcomer focuses more on realism in regards to aiming, bullet trajectories, movement, items, and tactics. It can therefore take more time to really get going. Already, I’ve seen people confess that they prefer watching streamers play King of the Kill, even if they find playing it themselves to be kind of a chore. King of the Kill-style battle royale may well be the next big Steam obsession, or it might turn out to be a one-trick pony (already, other battle royale games like The Culling have gained temporary popularity, only to disappear into obscurity after a month or two). Perhaps the new injection of competition will encourage the developers of both King of the Kill and PUBG to patch up the jank. Until then, if players say they’re going to quit—well, I’ll believe it when I see it.